Redfin (NASDAQ: RDFN), an online residential real estate company, is a recent addition to our Battle Road IPO Review Internet sector coverage. Founded in 2004 in Seattle, Washington, and led by CEO Glenn Kelman, Redfin began actively serving customers in 2006. Consensus estimates call for revenue of $364 million in 2017, followed by revenue of $480 million in 2018. With regard to earnings, the Consensus foresees a loss of $0.17 in 2017, followed by a loss of $0.04 in 2018. Redfin debuted on the NASDAQ on July 28th, 2017 at an opening price of $15 per share. The offering featured 9.22 million shares of Class A common stock, all of which came from the company. Following the transaction, there are roughly 98 million shares of Redfin outstanding. Redfin has a 180 day lock-up period that expires on January 24th, 2018. Goldman Sachs and Allen & Company were the lead book-running managers for the offering, with BofA Merrill Lynch and RBC Capital acting as book-running managers, and Oppenheimer & Co. and Stifel as co-managers. At a recent share price of $25, Redfin carries a market cap of roughly $2.5 billion. Redfin’s mission is to evolve the online real estate business to benefit consumers. To do this, the company has formed an online platform through which customers can buy and sell houses and schedule house tours with the push of a button. Redfin creates a thorough and expansive profile for every property on its platform. Once profiles are constructed, the company promote them to a wide set of prospective buyers on its website. The site is built with proprietary software, which the company believes constitutes a competitive advantage. Redfin’s real estate agents draw upon the company’s technology to form an affordable, quick, and quality service for customers. With commissions that normally range between 1 and 1.5 percent, Redfin is more affordable than the standard rate of 2.5 to 3 percent commonly charged by other real estate agencies. Redfin’s customers consistently gain value on their purchases, saving an average of $3,500 per transaction in 2016. With a 44 percent increase in monthly visitors on its website from Q1 2016 to Q1 2017, Redfin is the fastest growing top ten real estate site. The company boasted more than 20 million visitors to its website this past quarter. The real estate agents employed by Redfin are not only compensated by sales commission, but also customer satisfaction. Statistics illustrate the success of this sales strategy, as Redfin claims that its customer satisfaction rate is 32 percent higher than its average competitor, and the company’s customer retention rate exceeds that of its rivals by 37 percent. In 2016 alone, Redfin facilitated the transaction of over 75,000 properties worth more than $40 billion. Along with this, the company gained market share in 81 of its 84 markets in 2016. These 84 markets are all in the United States and span 43 states and nearly every major city in the nation. While Redfin’s revenue is steadily growing, the company is not yet profitable. In 2014, Redfin generated $125 million in revenue, followed by $187 million in 2015, and $267 million in 2016. This is a 49 percent increase from 2014 to 2015, and a 43 percent rise from 2015 to 2016. Despite rising revenue, the company still operates at a loss. Redfin posted an operating deficit of $25 million in 2014, $30 million in 2015, and $23 million in 2016. The company’s losses rose 22 percent from 2014 to 2015, but took a step in the right direction the next year, with losses narrowing by 23 percent between 2015 and 2016. To learn more about Refin’s Post-IPO financial position, and valuation relative to its Internet peers, please contact Battle Road Research at [email protected]. 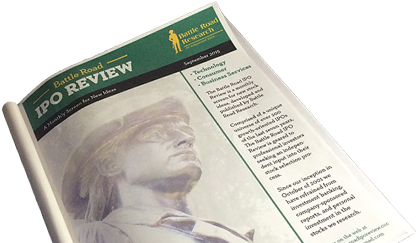 Asset managers and analysts may obtain a complimentary copy of the Battle Road IPO Review. Click here for further details. The Battle Road IPO Review is a monthly research service that screens for new investment ideas. Comprised of a unique universe of over 200 growth-oriented IPOs of the last ten years, The Battle Road IPO Review is geared to professional investors seeking an independent input into their stock selection process.